1. What the heck is Golden Paste? 2. How do you make Golden Paste? 3. How much do you take at one time? 4. Why add oil and pepper to turmeric? 5. Why does the Golden Paste have to be cooked? 6. Can you put Golden Paste in capsules? 7. How long does Golden Paste keep? 8. I don't like coconut oil -- can I buy the kit with a different oil? 9. How much Omega 3 does your coconut oil have? What the heck is Golden Paste? Golden Paste is a combination of turmeric powder, a non-inflammatory oil such as coconut or olive oil, and freshly ground black pepper. It was developed and perfected by Dr. Doug English, an Australian veterinarian, from various turmeric paste recipes in traditional use. In Indian cuisine, turmeric has always been used in cooked dishes along with oil and pepper. The Golden Paste is a single-ingredient combination that you can add to almost any food or beverage to mimic the way it's used in traditional Indian foods. Please be aware that while all three ingredients of the Golden Paste have therapeutic benefits (especially if you make it with coconut oil), we absolutely do not promote it as a medication or as a substitute for any pharmaceutical medication. If you have any concerns about whether its use is appropriate for you, or if it might interact with any medications you're currently using, or any condition you suffer from, please consult your doctor or pharmacist. In addition, while adverse reactions to Golden Paste are uncommon, they do occasionally occur. The most common ones result from starting out with too much at one time (see How much do you take at one time? for the recommended amount). Stomach rumbling, bloating, gas, soft or loose bowel movements or even diarrhea can occur if you are not used to eating Indian food regularly, and if you use too much Golden Paste at first. It's a good idea to consume more water at first. Some people (and some pets) experience increased urination. A headache may also result if you don't keep up your water intake. Very occasionally, a person may break out in a rash (usually confined to a specific area). "Detoxing" or "herx-ing" are common ways of referring to reactions to supplements. It's important to realize, however, that there is no such thing as detoxing, in the way the term is frequently used. Herx-ing refers specifically to the reaction caused by the die-off of large numbers of bacteria (sometimes experienced when antibiotics are taken). This should not occur when you begin to use turmeric in the form of Golden Paste. Your liver does not store toxins, and does not need to be detoxed. It filters toxins, yes, but only in order to excrete them (usually via the kidneys). If you have an undesirable reaction to Golden Paste, and you have not exceeded the recommended starting amount, please discontinue using it, or at least reduce the amount before trying again. It's very easy to make Golden Paste, and foolproof instructions come with every kit. But here is the	condensed version. Put 1 cup water in a small saucepan, and set aside another cup in case more is needed. Add 1/2 cup powdered turmeric and stir well over low heat. Bring just to a simmer, and hold at that heat for 7-8 minutes. Add more water if necessary, to keep the paste from becoming too thick. Allow the mixture to cool until it's just warm to the touch. While it's cooling, grind enough peppercorns to make 2-3 tsp ground pepper (about 7 grams), and measure out 1/3 cup coconut or olive oil. When the turmeric and water mixture has cooled, add the oil and pepper and stir thoroughly. If you don't stir enough, the oil may begin to separate after the paste goes into the refrigerator. If that happens, just stir again before using. How much do you take at one time?" Start out with a very small amount, 1/4 tsp or less, in or at least with food. Turmeric aids gut motility (movement). Starting out with too much may provoke very soft bowel movements or even diarrhea. Some people may have stomach rumbling or gas (farting). Having it in food means that your stomach and intestines are prepared and ready to digest it along with the rest of your meal or beverage. 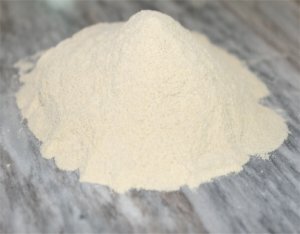 Many people enjoy Golden Paste in coffee or tea, or in smoothies or juice (orange juice and V8 seem to be two favorites). Stir it or swirl the cup or mug while you drink it, so the paste doesn't sink to the bottom. Golden Paste is tasty in eggs, in pasta or rice dishes, in soups, stews and casseroles. It virtually disappears in more strongly flavored recipes such as chili, spaghetti and lasagna (check out the Recipes page for ideas). Why add oil and pepper to turmeric? Turmeric will not dissolve in water, or water-based fluids like stomach acids. If it isn't dissolved in some kind of lipid (fat or oil), most of it will simply pass on through the intestinal system and be eliminated. So we dissolve it in an oil or fat before adding it to our meals. Turmeric can also be combined with ghee (clarified butter). That is a traditional fat in northern India, whereas an oil is more widely used in the south. Combining turmeric with an oil or fat allows it to be absorbed from the small intestine into the bloodstream where it can be transported to all the organs of the body. Why does the Golden Paste have to be cooked? It is not absolutely essential to cook the turmeric, oil and pepper combination. But cooking the turmeric powder in water first, before adding the oil and pepper, makes it more digestible. Many people have tried both methods, and find that the cooked paste is much more effective. Can you put Golden Paste in capsules? Yes and no. The moisture in the Golden Paste will dissolve both gelatine and vegetable capsules. So it isn't feasible to make capsules with the water-based mixture unless you do one of two things. You can fill a capsule and swallow it immediately before it begins to dissolve. Or you can fill a few capsules and pop them straight into the freezer. But you can also put capsule-sized blobs of the paste on a cookie sheet or plate, and freeze them without filling capsules. Some people freeze Golden Paste in the little trays that other pills come in, and some purchase silicone candy molds and fill those with pill-sized portions of Golden Paste. Feel free to come up with your own variation! How long does Golden Paste keep? Golden Paste must be refrigerated, and will keep for approximately two to three weeks in the refrigerator. If you think you won't use it up in that period of time, you can freeze half of it. Or follow the suggestions above and freeze in portion size drops or in a mold. I don't like coconut oil -- can I buy the kit with a different kind of oil? At this time, we sell the kit only with coconut oil. But you can purchase just the turmeric and pepper if you prefer, and buy olive oil locally. If you do that, be sure to buy virgin or extra virgin olive oil. How much Omega 3 does your coconut oil have? Coconut oil is different from other oils in that it does not contain Omega 3 fatty acid. and only a tiny amount of Omega 6 fatty acid. It contains MCT (medium chain triglycerides), a large percentage of which is lauric acid, the same fatty acid found in human breast milk.